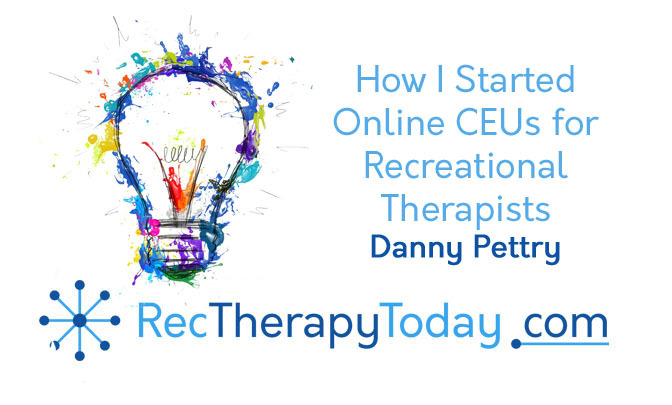 My site, DannyPettry.com (Rec Therapy CEUs) was the first online self-study CEU program created specifically for the recreational therapist. I definitely feel proud about the site and services. My online CEU program started in early 2007. Thousands of recreational therapists from around the world have completed a course through my program. How did I conceive the idea? There wasn’t any one event that happened. Several seeds had been planted in my head from a mix of inspirations. I can’t point out a time when the idea just popped in my head. 1998: Dale Carnegie’s classic How to Win Friends and Influence People encouraged me. I’ve disclosed that I didn’t start reading books independently until I was a senior in high school. Carnegie’s book was the first that I read on my own accord. I loved it. I’ve been reading self-development books since then. I enjoy reading, learning, and teaching what I’ve learned. 2003: Charlie Dixon’s Therapeutic Recreation Directory encouraged me. Charlie is my mentor, friend, and fellow West Virginian. I created TeachLeisure.com in 2003 to sell leisure education booklets that I had created. Charlie helped me a lot with getting started. Charlie told me, find something that isn’t offered at his site (the TR Directory) and offer that. Self-study continuing education courses were not listed at Charlie Dixon’s TR Directory site. My site, www.DannyPettry.com (Rec Therapy CEUs) became the first self-study continuing education program to be listed at his site (in 2007). Many other, newer programs are now featured at Dixon’s TR Directory. 2003: National Council for Therapeutic Recreation Certification (NCTRC) – I became a Certified Therapeutic Recreation Specialist (CTRS) in Feburary 2003. I learned about the need to earn Continuing Education Units (CEUs) to renew my own national certification. NCTRC had a document with ways to earn CEUs. “Home study” and “internet” were two (of several methods) listed as ways to earn CEUs. This document planted seeds in my mind. 2004: Napoleon Hill’s Think and Grow Rich book encouraged me. I have a strong passion for reading self-improvement books already. Many self-made millionaires and successful people attribute their success to this book. The late U.S. Senator Jennings Randolp, from West Virginia encouraged Napoleon Hill to write this book. I decided to read it. Hill suggested obtaining specialized knowledge and skills as one secret to becoming rich. He suggested people could take distant education courses to gain specialized knowledge and skills. 2004-2006: Indiana University’s distance education program encouraged me. I wanted to become specialized in recreational therapy. I admired Dr. David Austin as a leading expert in recreational therapy. I purposely selected the distant education graduate degree program at IU because Dr. David Austin was a professor there. I was in his last class (social psychology) before Dr. Austin required. I was able to complete the full program from my here in West Virginia. I’m proud to have earned a Master’s degree in Recreational Therapy. I thought I’d become an adjunct instructor for for the undergraduate degree program in rec therapy at my hometown school, Marshall University (MU), where I earned my undergraduate degree. However, MU closed their Recreational Therapy degree program in 2006. There were no other local colleges. I still wanted to teach and I felt I had met qualifications to create online self-study courses with a master’s degree. 2005: American Therapeutic Recreation Association’s Peg Connolly Scholarship Award encouraged me. Students in undergraduate or graduate degree programs are awarded these scholarships to attend the national conference. Those who win are required to monitor attendance for sessions and “hole punch” CEU sheets to indicate who attended what session. I was one of the winners in 2005. I don’t choose to fly. I drove west on I64 from little Huntington, West Virginia all the way to Kansas City, Missouri in 2004. It was a lot of hours. I listed to inspirational books on CD during this trip. I also thought there must be a better way to get to get information from these conferences too. I thought maybe more local conferences. My idea for self-study continuing education (based on reading books or listening to them on audio) may have popped in my head during that trip. I thought I wanted to teach after I graduated and I could help encourage other recreational therapists to read more books!. 2006: Tom Heck (a teacher/ coach) was introduced to me through Charlie Dixon. Heck had created ebooks. He taught me how to change my leisure education booklets into ebooks. That was an amazing step. I sought out business coaching with Tom Heck. He gave me a small prescription for success to help me with my TeachLeisure.com site and services. Heck told me to do everything he told me to for one year and that I’d be in a different place spiritually and financially. I did it and I was. 2007: Unlimited Future’s small business incubator had a free course in January 2007. I had gained experience with consulting and training through graduate school at Indiana University. However, I didn’t know how to start a business, so I learned. I took the free course. I’m listed as one of their graduates. I opened my online self-study CEU program, DannyPettry.com (Rec Therapy CEUs) in April 2007. The business is over 10-years-old. And that’s how I did it. I’m sure there were other elements that encouraged and inspired me as well. But these were the seeds and elements that I remember. I was influenced by other people and I believe my site and services has influenced many other businesses too. Post below to let me know how DannyPettry.com has influenced you, your work as a recreational therapist, or your business. Need CEUs? Try Danny Pettry’s Rec Therapy CEUs: helpful and convenient to use. Passion, determination and inspiration led you to succeed and you are inspiring others now!